Late Sunday night, I completed editing the manuscript for my new book, “Short-Term Missions Success: Defining Moments Toward Long-Term Growth” and uploaded it to Amazon. It would take a few more steps before it was available, both in paperback and Kindle e-book formats, but those are done and we’re good to go. 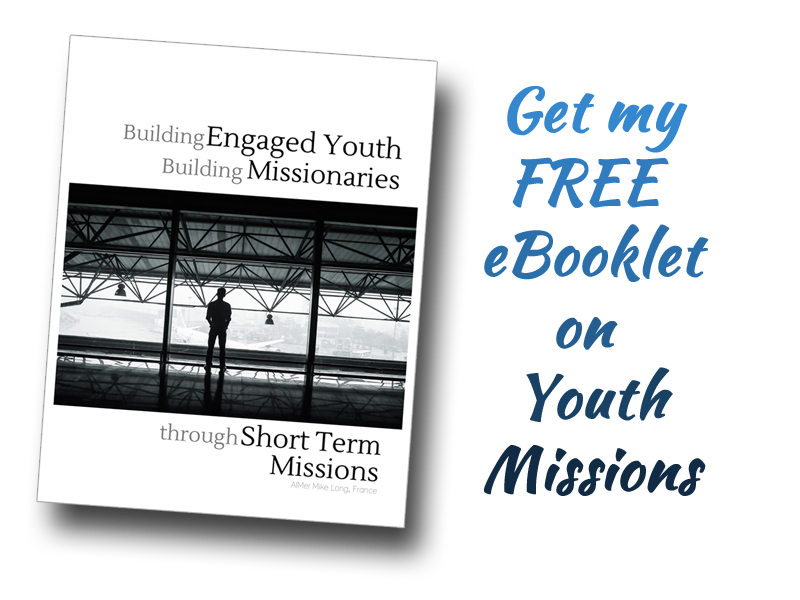 This book is 150+ pages of things I’ve learned in my 30+ years of doing short-term missions (STM). Some say that long-term positive change as a result of short-term missions is exceptional… if they’re right, I’m an exception. I can’t say enough about the impact STM has had on my life, my family and my walk with God. On Wednesday, Liz & I had a video interview with the GMAC committee of Global Missions about our application for Associate Missionary status (essentially the next step after A.I.M.). This wouldn’t be a huge change in terms of our day-to-day responsibilities, it’s simply the next step in the process. After 2.5 years in France, we’re really beyond the scope of the AIM program which is typically designed for shorter terms of service. We feel positive about how it went and will know the outcome at the end of August. Here you can see us testing out the software with Tom Harding, assistant to Bro. Howell, director of Global Missions. Well… our wanderers finally made it home last night after two weeks away. After 1 week in Belgium with Liz’s parents they spent the second week in Dublin with good friends. The weren’t able to get a Tim Horton’s as Timo had been hoping. Apparently the Irish don’t appreciate their double-doubles the same way we Canucks do – it closed down some time ago. Who in Canada could imagine a Tim’s closing down? It’ unheard of. Still though, they got to the Dublin Zoo, got out on a boat tour of Dublin Bay (Timo even went for a swim) and saw many other sights (incl. Donald Trump in the wax museum) on top of simply enjoying time with long-time friends. So Liz & Timo only got home last night but already, following service tomorrow, Soph & Dominic and I will hop a train to Paris and fly out Monday for North American Youth Congress in Indianapolis. 30,000 young people are expected for this event. The kids will be attending with 40 other missionary kids and they’ll also get to spend some time with their youth group from Saint John. It should be an incredible time! Outside of services, I’ll be hanging my hat at the AIM/Next Steps booth to a great extent; as a resource for other young people who may be considering STM. I’ll have printed copies of my book there as well. Please keep this trip in prayer. Such an incredible opportunity for Dominic & Soph… to say they’re excited is an understatement! Well… There’s lots to do before leaving tomorrow (including enjoying time with Liz & Timo) so I’m going to sign off for now. If you’re interested in learning more about the book… click here. Thanks for spending this time together. Kylie and I will be looking for you guys at NAYC! Thanks Brigid… With the book done I think maybe I’ll be able to breathe a bit more… Hoping to anyway.